Stay tuned for a spring tour with Pork Chop Willie opening for Garry Burnside. We are setting up the dates now. Yay, heading back to Mississippi to play the Deep Blues Festival again this year. So many great musicians and a chance to catch up with our friends. We'll do an "acoustic" duo show on Friday at Noon and full band on Sunday at 3:45. Both shows at Shacksdale Stage across street from Hopson's in Clarksdale. We've been back playing in NYC and its been great. Mostly we've been at two or our favorite venues, The Way Station in Brooklyn and Shrine World Music Venue in Harlem. Check out our Calendar page for upcoming shows. Wow. So much fun and so much good music at the Juke Joint Festival this year. Best part is seeing all of our friends that we've made coming down every year for nine years now (can it be true??). Let's do it again next year! Coming up soon: The Junior Kimbrough Cotton Patch Festival in Holly Springs, May 12-14. All the Hill Country bands you want to see: Kimbrough's and Burnsides galore. Open Jam Friday night, school on Saturday and concert on Sunday. Not sure what time our slot is yet. We'll post in calendar as soon as we know. We're thrilled to be invited to play numerous times at the Deep Blues Festival this year. We have are playing Thursday, Friday and Sunday. Bill will join Garry Burnside at Red's on Friday. We missed last year after playing this festival six years in a row. Can't wait! It's such a great weekend, filled with friends and music. We are back at Red's once again on Saturday night. It doesn't get better than that. The new year brings sad news about our friend and guitar player, Steve Tarshis. Steve passed away on January 3 after a struggle with cancer. He was a core member of Pork Chop Willie and an important part of the lives of many musicians in the New York City area. He was a guitar teacher, mentor and player of the highest order, loved by everyone who met him, and was the leader of the highly respected Steve Tarshis Trio. “I met Steve a long time ago,” Bill recalls. “He gave me guitar lessons. A lot of years later, I timidly asked him to join Pork Chop Willie, wondering how he would feel playing in a band with one of his former students. Steve graciously accepted. I often said when introducing Steve that he was my favorite guitar player. And he really is. He was so versatile, and his ability to step forward with a jaw dropping solo or lay back and make the rest of us sound better was astonishing. I routinely stole licks from him and we’d laugh about it in the middle of a song. WE’RE MAKING A NEW ALBUM!!!! We’ve got great news! We’ll soon be making our next album—the follow-up to 2014’s critically heralded Love is the Devil. (Buy it right now at CD Baby, Amazon or iTunes if you don’t have a copy!) We don’t want to let too much out of the bag just yet, but we've written a bunch of new songs that we're really excited about. 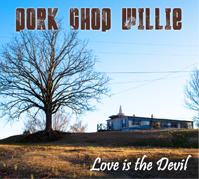 And just in case you need a reminder, here’s what some folks said about Love is the Devil—the album that propelled Pork Chop Willie onto radio worldwide and got us invited to well-known festivals like Helena Arkansas’ King Biscuit and Clarksdale’s Juke Joint fest. Pork Chop Willie founder Bill Hammer has managed to collect some very nice guitars and loves playing them all. “But when it comes time to perform,” he says, “I have always reached for my Trussart Telecaster Deluxe that says “Hill Country” on the body. The body is metal and it doesn’t have the sweet sound of a wooden guitar, but it has a rawness that is perfect for the music we play. So no matter what new acquisition I might have, I always reach for the Trussart when I’m going to be playing for people and want to sound my best. “Then, visiting a guitar dealer, I saw this one. It has a ’53 Esquire body, all original, and a ’55 Telecaster neck, all original. The neck looks and feels well worn in, but the body is in remarkably good condition – which I took as a warning sign because common wisdom says that guitars that have been played sound better than guitars that have not. For that reason, I first tried a very battered ’52 Telecaster that the seller also had. It looked the part. The neck pickup had been changed, but the bridge pickup was original. It sounded very good and I figured I’d look very cool with this very battered old Telecaster. Then I picked up this Esquire/Tele mongrel. It was at a whole other level. It has the nastiness of a good Tele, burbling right on the edge. But the tone itself is quite rich, deep and multi-dimensional. The combination is wonderful. I didn’t have the cash for it, so I was going to have to sell/trade some of my others guitars to get it. Before I did that, I wanted a second pair of ears. I brought Steve Tarshis, the other guitar player in Pork Chop Willie. He started to play this guitar and after three notes stopped and said, “holy sh*t.” LOL! I said, “Right?” He played some more and played the other Telecaster. His verdict was that the other Telecaster sounded good, but that this one sounded just like the old records. "That’s a special guitar," said Steve. “Miraculously, the stars aligned this year for me to attend the Grammys. It just so happened that I had a number of shows in LA the preceding week (with Five for Fighting, which were SO much fun!) and I had so many good friends nominated this year that I decided to stay through and hang out for the party! I thought this year in particular was a fantastic year to be attending. I finally saw Madonna, STEVIE WONDER, and Paul McCartney play live, as well as Tony Bennett & Lady Gaga, John Legend – who all killed it – and of course Beck, Chris Martin, John Mayer, Beyonce. Plus I had a number of friends on stage joining all of them. Of course, seeing Prince in person didn't hurt either...and to top it all off, some friends very near and dear to my heart were nominees and recipients, some for the first time, so all in all it was just such a special and beautiful weekend. A huge shout out to A Great Big World, Dan Romer, Chris Thile & Edgar Meyer, A Far Cry, Mike Marshall and the Turtle Island Quartet, Noam Pikelny and Nickel Creek, and congratulations to all of this year's nominees! Wow. We are so honored. Blues411's Annual Jimi Awards were announced today and Love is the Devil was named in both the Best Blues/Roots Releases and Best Debut Albums categories and Melissa was named in the Best Instrumentalist-Other category. How cool is that? We’ve confirmed dates and our first guest for four shows in our “North Mississippi Hill Country Night” series at the Shrine World Music Venue in New York City for next year. The shows will be on January 29, April 23, July 30 and October 29. For the January 29 concert, Garry Burnside and his band will be featured. 2015 will be the sixth year of the series, which brings the best of North Mississippi hill country blues to Manhattan. Each show features Pork Chop Willie and at least one other guest artist doing full-length sets. If you’ve never been to one of these shows, put these dates on your calendar for a unique musical experience in the Big Apple. WE’RE HAVING A GREAT YEAR, THANKS TO YOU!!!! We’ve gotten reviews in publications like DownBeat and Living Blues, plus airplay on hundreds of stations including the two-million listener "B.B. King's Bluesville" on Sirius/XM Satellite Radio. We were also honored to be invited to play multiple shows at the prestigious King Biscuit Blues Festival in Helena, Arkansas in October. If you don’t yet own a copy, Love is the Devil is available at CD Baby, Amazon and iTunes. And, of course, you can hear all the songs at this very website! We have received so many great reviews on our album, Love is the Devil. But this one holds a special place for us because we have so much respect for Living Blues Magazine. "With this hypnotic, modern approach to the spiritual purgation that is great hill country blues, Pork Chop Willie should turn some ears…Tracks like Too Many Cuts are strikingly original as the yearn of Tong's violin provides a fresh spin on an old formula…The debut album...is as raw as any hill country stomp and as haunting as the most backwoods Appalachian holler". The full review is in the August issue. Please check it out. Love is the Devil, #1 on the AirPlay Direct Blues Chart all of June! June 3rd was the official release date of Love is the Devil. It is now available at iTunes, Amazon, CD Baby and many other outlets. We’ve been overwhelmed by the response to the album. Thank you so much to everyone who has supported us and this project.